My name is Rachna and I am 19 years old. I am married and I have one child. I would like to tell you about my life. I come from a Hindu family and have one brother and two sisters. My father used to have a small shop of rubbish pickers in the market place. He used to earn around 50-80 rupees per day (approximately £1 per day) and his wage had to support all five members of my family. I dreamt of earning some money for my family by making clothes but it wasn't possible because we didn't have a sewing machine. Once a boy came with his parents to see my sister so that they could arrange a marriage. At this time I was only 14 years old, but the groom's brother liked me so much that he asked his parents if he could marry me. So I got married at a very young age and after a few years I become mother. It was hard for me: my dreams were shattered and I was living in a small village with my husband and son. 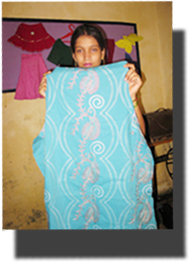 Then my friend Sunita told me about a centre where she went to learn sewing and embroidery. She invited me to go with her one day. That's how I came to ANUSARAN for the first time and I will always remember it as a blessed day in my life. All the girls there seemed so happy - they were learning, laughing and dancing. I had never experienced this before. I talked to the group leader called Sister Shashi and with her help I registered with Anusaran so that I could start learning there too. 1. Since starting at Anusaran one year ago, I have learnt many important things. One of the most important things is that I know more about myself, who I am and where I need to change. I pray to the true God and he works on my weaknesses. Previously, people laughed at my weaknesses but there are so many sisters in Anusaran who don't laugh, but instead help me to overcome my weaknesses - especially Aunty Abha. 2. I am learning how to read and write in class and now I can understand some English and I can also speak a little. I feel confident that I will improve a lot more whilst I am here. But the best thing is that now I can help my son to speak in a right and Godly manner and that makes me very happy. 1. I want to study more by enrolling for formal education through Anusaran because I have been encouraged to study further. 2. I want to open my own tailoring business in my house so that I can earn some money and help my husband with living expenses. 3. I want to help other girls who have not had any opportunity to learn - with the help of Anusaran I want to reach to them. 4. Above all I want to live a holy and perfect life because this is what God created me for. Appeal : Please pray that I would be able to reach my goals.